New Relic Brainiacs: Win a Laptop Bag! Hi, @ian.arsenault: FYI, certificates are issued by a human (me). I won’t issue another certificate if you already have one, which is why you did not receive one the second time you passed the test. You may, however, login at credential.net and change your name, email address, etc. Massive congratulations to this weeks Brainiacs! All tests completed! I never did get the tshirt from the 1st 4 quiz challenge. Also I noticed on my badges page does not reflect my Certified Performance pro Cert (issued May 19, 2018). If possible can you assist with that or refer me to someone who may be able to assist (a co-worker brought it to my attention lol). Don’t worry about it, it’s not petty at all - I understand the desire to grow the swag collection (I really want one of the laptop bags for myself!!). That said, there hasn’t yet been an email sent for this, so don’t worry you haven’t missed out yet. Then when Brainiac badges are being issued tomorrow you should be all good. 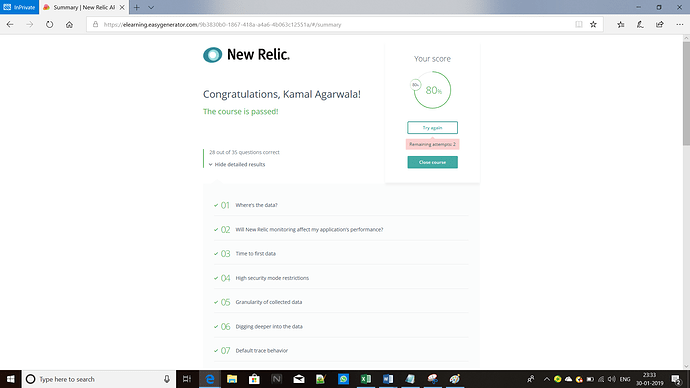 You have proved that you are all New Relic experts. Have cleared the certified profession pro 2 days back. Yet to receive the confirmation mail or the badges. Could you please check? Its Great Quiz & Thanks for this wonderful opportunity. First of all thank you New Relic for creating such great platform for us. I learned a lot & still learning. Also I’m waiting for future opportunities from New Relic. It’s so great to read this feedback, thanks for commenting here - we’re glad you enjoyed the quizzes, and the broader platform. I have not got the certificate yet. Its almost a month I have completed the same. And have not received the forms for Laptop Bag. Hi there @kamal.agarwala - I just checked and do not see you (at the email address you use here) on our list of folks who received their certification. If you would please DM me with the email address you used for your certification, I can re-check. I have uploaded the screen shot for the same. Hey @kamal.agarwala - The New Relic University APM Certification has limits on the number of allowed retries for that quiz. It looks like you may have exceeded that limit before passing. You can of course redo the quiz when you become eligible once again (April 30th 2019), at which point you can become certified and we can get your badge assigned. @Linds finally! I completed the course and passed the test. Do I still get the laptop bag, or too late? BTW, pretty good learning materials. Been using APM for a while, but helped discover some features I haven’t used. Thanks. Hey @kenpropel - I’m afraid the laptop bag series has finished! Don’t worry though, there’ll be plenty more opportunities to win some sweet New Relic swag in the coming months. Be sure to look out for those opportunities. Thanks though for your amazing feedback, we’re so glad this series of quizzes helped you to learn some more!